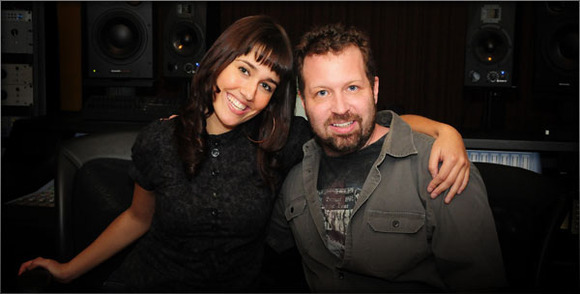 SALT LAKE CITY, Utah – While searching for the ultimate sound combination to complete the freshman album of pop singer Jenna Andrews, GRAMMY® and EMMY® Award-winning producer Andy Zulla, deployed the Lexicon PCM Native Reverb Bundle to develop one of the most unique-sounding albums to date for the young Toronto native. With influences stemming from Hip Hop, R&B and Pop, Andrews had visions of an album with a sound combining a blend of retro-sounding, wet mixes and a contemporary, dry and tight mix. Zulla knew he would have to summon the perfect reverb that sounded full and dense, while also having a transparent, non-existent feeling. Having sold his Lexicon 480L and 960 before taking on this project, he hadn’t realized that hitting this perfect mix without them would be difficult. “The problem was once we went for a dense reverb, it became very clogged and heavy; very lifeless yet very apparent,” said Zulla, Mixer of multiple number-one hits and more than 20 gold and platinum records for artists such as Kelly Clarkson, Jessica Simpson and Rod Stewart. The powerful PCM Native Reverb Bundle includes seven signature Lexicon reverbs including: Vintage Plate, Plate, Hall, Room, Random Hall, Concert Hall, and Chamber with over 950 of the most versatile and finely crafted studio presets including recognizable classics from Lexicon’s immense library of sounds. Zulla and Andrews’ completed album, ‘The Moon And The Stars’ on Island Records, will be released in the summer of 2010. Her first single, ‘Tumbling Down’ was released May 17, 2010. The PCM Native Reverb Plug-In Bundle is ideal for recording and post-production environments where unsurpassed quality is required. It is a fully functional cross-platform plug-in that is compatible with Windows® XP, Vista, and 7 along with MAC® OSX 10.4, 10.5, 10.6. It is available now with a suggested retail price of US $1899. To activate a free 7-day trial of the Plug-In, a user can visit www.lexiconpro.com for an iLok™ authentication key.